Where is a student’s tea distributed? Probably in a teapot. Thus the Student’s t-distribution teapot is born. 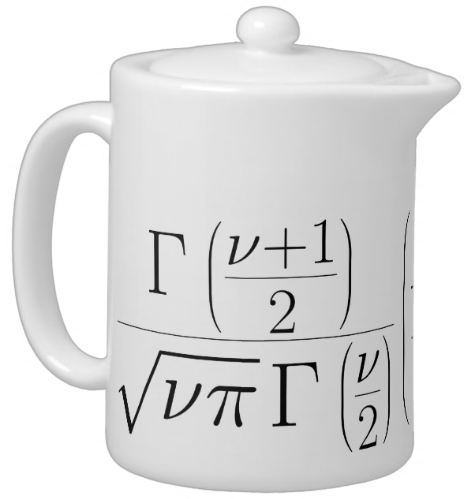 Warmly emblazoned across the outside is the probability density function of Student’s t-distribution, in case you need to estimate the mean of a normally distributed population and pour a cup of tea at the same time. Lovingly designed for students and academics who take their probability and statistics as seriously as they take a proper brew. You can get one for yourself from Zazzle. Goes nicely with a t-set mug.